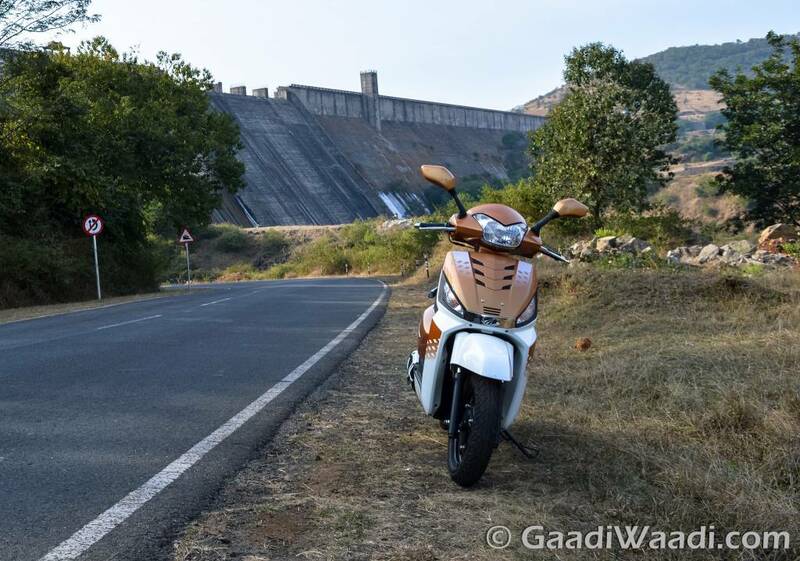 Mahindra is on an aggressive streak given the plans they have ahead and the plans that have been executed very recently as with the launch of Mojo and Gusto 110cc that happened back to back in the past two year. 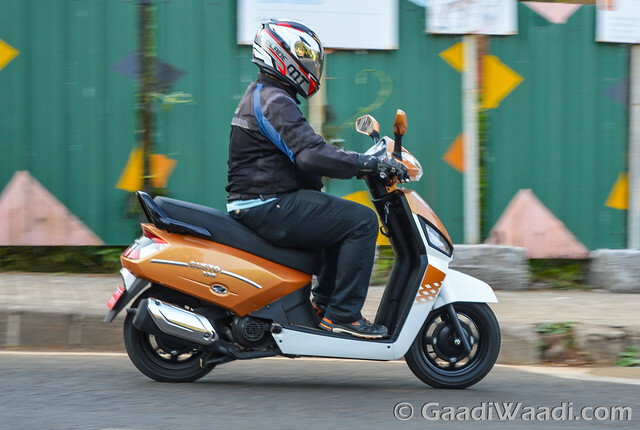 Today, there is another scooter coming in the market from the Mumbai based manufacturer and that is a new 125cc scooter. No, it’s not the Mahindra Duro or the Rodeo as they have been or will be phased out very soon officially. 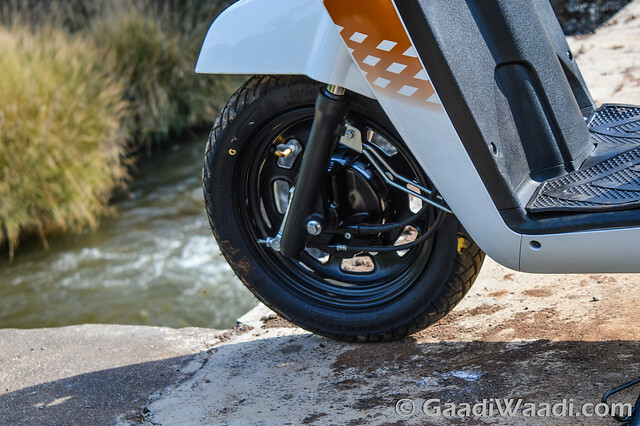 Today is the day that we witnesses the Mahindra Gusto 125. 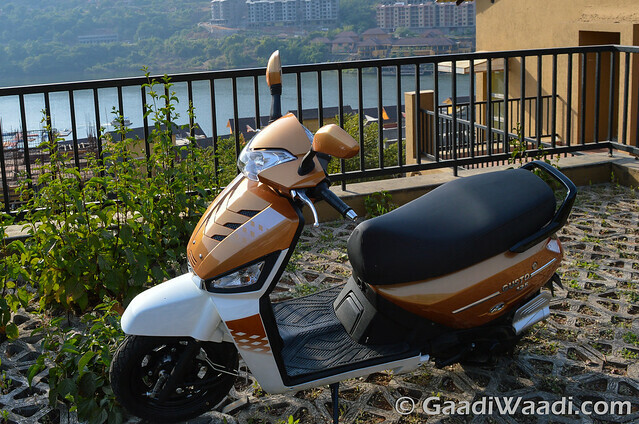 Yes, a 125cc Gusto has made it to production as the platform is already very promising and at the time of launch, the scooter promised a lot more and infact has been living upto the mark when it comes to sales, service and quality. 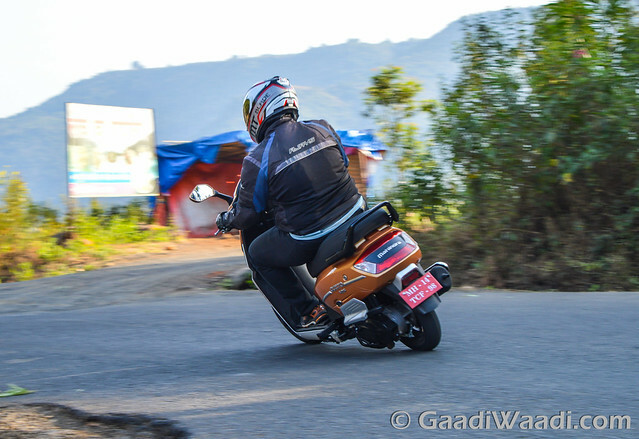 Today, we test rode the 2016 Mahindra Gusto 125 to tell you how does it feel like over the 110cc variant. 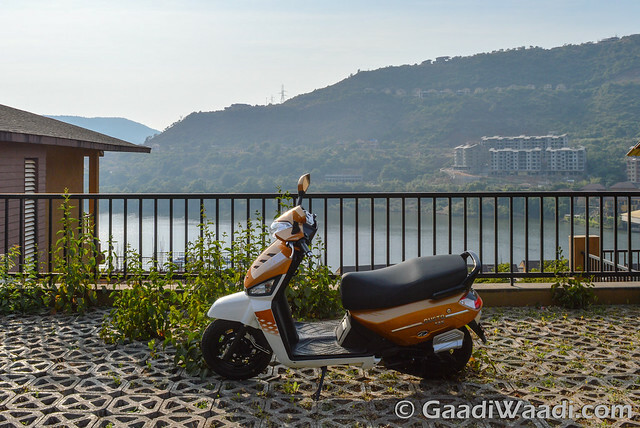 We are here in the famous hills of Lavasa to test it thoroughly to test if it has enough ‘Gusto’. Styling remains the same as the Gusto 110cc. The boxy front mudguard and the side panels remain the same. The side panel has a chrome strip to make things more premium along with a new ‘125’cc badge on it to denote its a higher capacity motor underneath. There is a chrome heat shield on the exhaust to make things stand out. What really makes things easier to recognize over the 110cc scooters are the new color along with a visible change to the front apron which has faux vents. Mahindra has done a fantastic job with it as the colors look really good in person. The black and red are going to the best sellers meanwhile the blue and orange combo will attract the youth and bling seekers for sure. Expect these scooter in specific (dual colors) to woo you in showroom. 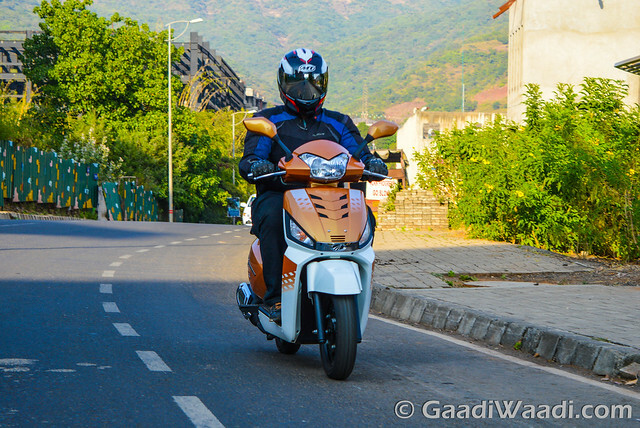 The front apron and headlight is the most mature part of the scooter and continues to impress with the 125cc variant. The alloy wheels remain the same and are painted in black to add to the sportiness. Levers are high quality and are finished in chrome for add a new thing to the package. Bar-end weights are unique and a rare addition which look odd on the scooter but its done to control vibes at the handlebar. Overall, the Gusto looks better and has right balance of bling and sportiness to attract all kind of customers. The seating position is upright on the Gusto with a very wide and comfortable seat. The seat is an adjustable unit, Gusto trademark that can be lowered or raised by a large 40 mm and is easy to get it done too. The handlebar has been placed in such a manner that it doesn’t make things harder for both kind of riders. ORVM are quite large and give a good view of what is behind. There is car like inspired glovebox in the front of cluster which can help you keep nick-nacks. Switch gear is off high quality and do the job very well and as intended. The Speedo is plain vanilla unit and doesn’t much to show off either. Old age fonts with shift lights and fuel gauge are here to do the job just about ok. Mahindra could have done something about this as the meters continue to be the same despite criticism from the past. Powering this Gusto is the highlight of today’s review. The engine is a new 124.6cc engine which makes similar horsepower to the 110cc at 8.5 BHP but now the torque is slightly higher at 10 Nm which comes at 5500 RPM. 1 Nm of torque and .5 BHP has been increased along with the capacity of the engine. 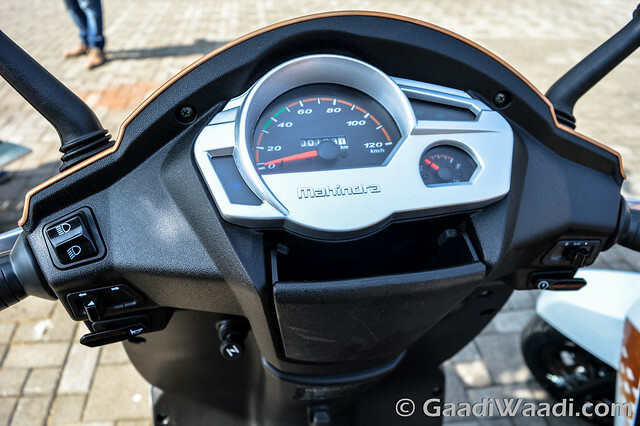 Mahindra has improved the ignition system, the gearbox, a heavy-duty clutch has been adder, larger carburetor, a silent chain, along with low friction piston rings for smoother and increase fuel efficiency on the scooter. How does all of it feel on the road. Well the NVH level are superb for starters, the engine smooth and refined and there is very little noise despite extra punch in the engine. Mid range feels distinctly enough punchy and the power band is slightly bigger more to play around with as the top-speed has gone higher from 85 km/hr to 90 km/hr and that is when you notice vibrations on the floorboard. There is much more pronounced torquier feel in the engine, which makes justice to the 125cc tag on the outside. 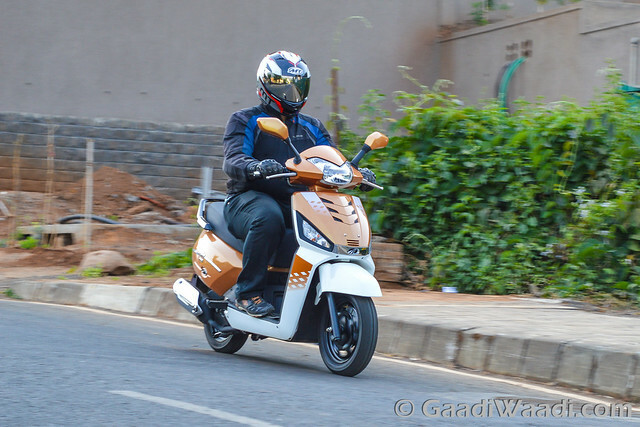 Driveability in the city is as always great and the extra punch allows it to pull more freight and the already high kerb weight the scooter has at 123 kgs which now makes sense but is still around 7 kgs heavier than the segment, and not the 10-15 kgs like the 110cc segment standard. G108 is based on the G101 scooter. If you didn’t get that what that means is that the Gusto 110 is exactly the same as the Gusto 125. Mahindra says they have made changes to the suspension when it comes to damping to make things better and more suitable for the new role. Ride quality as always is brilliant, the stability is class leading thanks to high kerb weight and 12-inch wheels backing it. Tyres are good on this premium scooter. 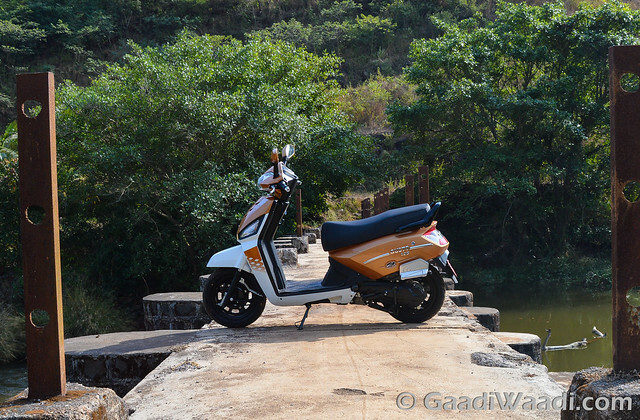 Handling is good, the scooter is almost agile in the corners and the long enough wheelbase means its planted in the corners. Turns-in well enough and there is good grip from the scooter and it went through demanding Lavasa twisties well than expected as it continued to scrape the main-stand again and again. Racy looks, Pacy Power, ‘Kisi se Kaam Nahi’ and many more slogan that Mahindra has been using clearly live upto expectation to a big extent. The Gusto has segment best power and torque figures from the engine, but the overall numbers aren’t that impressive, such as the kerb weight and long wheelbase. 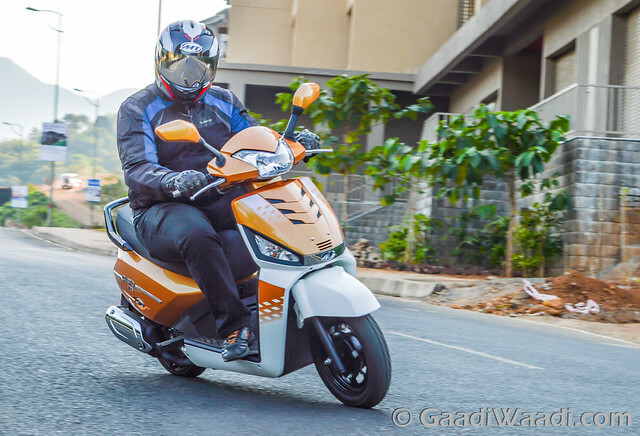 The Gusto does offer a lot when it comes to practicality, sold ride and handling balance along with even better rideability than before. With colors doing most of the job of injecting some distinction when it comes to styling, the scooter becomes a pretty good package. 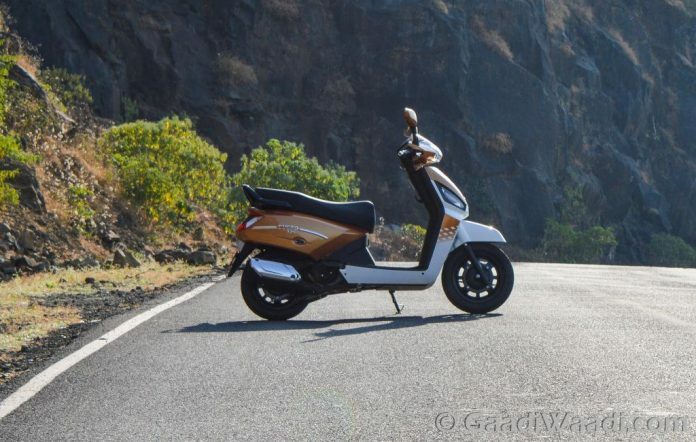 We will have to wait for the pricing to come, However we expect a price increase of Rs 5,000-6,000 which should help it keep the value tag as it is premium scooter and has a lot of features to boast about.